Ten years ago, an inscrutable and abnormal territory known as Hell's Gate appeared in Tokyo, altering the sky and wreaking havoc on the landscape. The heavenly bodies disappeared, replaced by false stars. During this time, people possessing various special abilities emerged, each capable of different supernatural feats - these are known as Contractors. Each fake star has a corresponding Contractor, which reacts to their activities. As such, Contractors are usually identified by their star's Messier catalogue number. Kept secret from the masses, these individuals are known to murder in cold blood, smothering unnecessary emotions with logic and rationale. Their incredible abilities, however, are gained at the cost of their humanity - Contractors are thus named because of an involuntary compulsion to "pay the price" each time their power is used, which can range from eating particular foods and completing meaningless tasks, to self-harm and having their bodies change in peculiar ways. Various nations and organizations around the world train and utilize Contractors as spies and assassins, resulting in violent battles for valuable objects and information. 5474 users rated Darker Than BLACK [TV]. 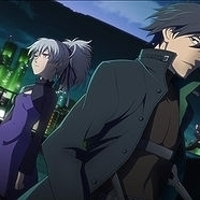 Return to Darker Than BLACK.